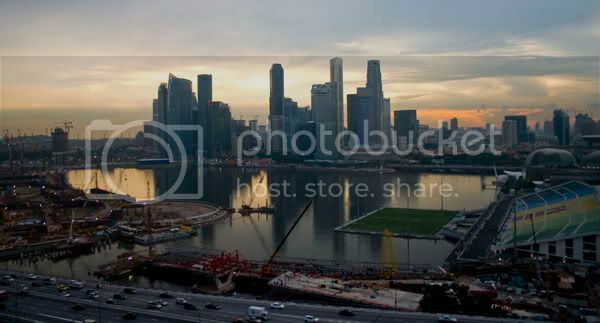 The city of Singapore looms above the bay, as seen from the Singapore Flyer. 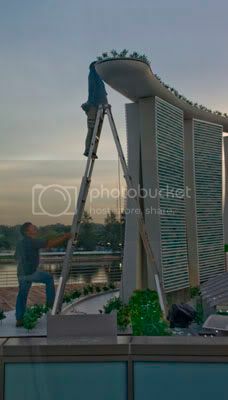 For more economically successful photos of Singapore, click here. Her hand dangled, for all intensive purposes, like a mossy stone, her lightly clenched fist enveloped in the soft caress of the young gentleman at her side. Their fingers didn’t intertwine, but the telltale flirting glances darted between them. It was as if Matt knew that the odd chastity I had seen in the innocent courtship of the couple seemed awkward and strange to me. It was a sensation I grew accustomed to quickly in Singapore, a city so sparkling clean that seeing trash outside of a trashcan seemed shocking. So much about Singapore is a beautiful veneer of perfection. The populace is clean and well clothed. Most people have iPods or PSPs and live in a perceived semblance of luxury. The buses, taxis, and streets are clean, fast, and very well kept. Nearly every building seems prim and proper, well maintained and cooled to a perfect 72 degrees Fahrenheit. Outside of the exorbitant corporate costs of the nicer restaurants, there doesn’t seem, on the surface to be anything to complain about. But it’s there, lurking just beneath the surface. Gum is banned. You can chew it, but you can’t buy it. If you spit it on the ground, it’s fined heavily. If you eat or drink in the subway, it’s fined heavily. Want to see a rated R movie? Well, it’s likely been edited for content by the censorship board. And don’t even think about wearing an article of clothing that might be considered lewd. As Matt told me, the populace is rife with undercover police just waiting to take your money. And in Singapore, money is king. The island of Singapore has always been a commercial hub. It was a major trading post for the British East India Company in the 1800s and soon became the hub of the British Empire in the Far East. In 1963, Britain granted Singapore its independence and it immediately joined Malaysia to the North. Two years later, it split, though the exact details of this are different depending on whether you’re listening to the Singapore side of things, the Malay side of things, or the British outsider’s side of things. Whatever the case, The Republic of Singapore blossomed into Asia’s largest port and a business mecca. My first night in, Matt’s dad Kirk explained that Singapore is a successful business. Its parliamentary democracy is dominated by the People’s Action Party, which has been in power since the 1960s. There are 94 seats in Parliament, 84 of them elected, 1 guaranteed dissenting seat, and 9 appointed spots chosen by the chair of Parliament and not affiliated with a party. Most recently, the PAP won 82 of 84 elected seats. Being an official in the government of Singapore is like being a CEO, Kirk told me. Rather than be paid set wages, they’re given a portion of society’s profit. If the people are happy, taken care of, and there’s surplus, officials get paid well. If they’re unhappy, poorly taken care of and there’s a deficit… well, that hasn’t happened. Singapore is the sixth wealthiest nation in the world by GDP per capita, not that I’m even sure what that means besides people are reasonably wealthy. The beauty of an economic utopia is almost too much to believe. Its sparkling appearance is awe inspiring and joyful. And it wasn’t until I tried to wear my Molotov Cocktease t-shirt out on the town that the insidious reality is a scary curbing of freedoms that is light enough to appear negligent, but heavy enough to land Singapore on Amnesty International’s shitlist for an over abundance of executions among other violations. “You shouldn’t wear that,” Matt warned. “Mitch, what do you think?” I asked, seeking a second opinion. “In that case, I’m changing,” I said, caving in. It’s not as though the shirt is actually offensive. It’s merely yellow silhouette on a charcoal background, the text barely legible unless you take the time to stare at it. Still, according to the Hulse brothers, its “suggestive” content might well be enough to get me fined or arrested. Currently, construction is in progress on two “integrated resorts,” which will offer casino-style gambling in the guise of family friendly amusement parks. They won’t say they’re casinos because they don’t want that sort of rabble in Singapore, but the money made by Macao and Hong Kong, their sister cities, is too good to pass up. It’s enough to change the rules, but not enough to reveal the reality of their actions. This emphasis on an unfailing facade is only indicative of the issues at work. The legal system, while supposedly fair, doesn’t offer a jury trial. Caning is an acceptable punishment, and we’re not talking your old English school system style caning. There are 8 Singaporean TV stations and 14 radio stations, all owned and operated by the government’s MediaCorp. Even the newspapers are essentially a monopoly, the one exception also owned by MediaCorp. Freedom of Speech is virtually nonexistent. Two major colleges refused to open branches despite offered tax breaks because of academic freedom issues. And yet, for all these flaws, the simple joy that is Singapore is almost enough for me to ignore my First Amendment absolutism. Its wonderful food, beautiful streets, and unadulterated wealth and business formality are all enticing. Everywhere I looked, I saw happy people, enjoying the fruits of their labor. That’s when I began to wonder if Singapore, for all its concessions to repression and censorship, had actually achieved the American dream. Or, more likely, it’s merely a lovely veneer gently wrapped around solid core of economic success. Love your blog! It’s a nice 4:50 p.m. respite from the last dragging minutes of the work day. Hope you guys are having an awesome time! P.S. Yay Molotov Cocktease! I was going to be her for Halloween, but then I thought… how will I keep that thing ON?